Bushy perennial with bright green, 'corrugated', aromatic leaves and royal purple flowers with black calyces. Flowers nearly all year round. Attracts bees and hummingbirds. Prefers a sheltered position in full sun and well-draining soil. Usually trouble-free, but may get damaged by slugs and snails. Deer-resistant. Very easy to propagate from cuttings. Tolerates moderate frosts (to about -8 deg Celsius). Protect during colder temperatures or grow in containers and move indoors for the winter. Remove spent flower-spikes to prolong flowering (this also helps to keep the pant compact). Herbaceous perennial or evergreen sub-shrub in the Lamiaceae family, native to Mexico and Guatemala. Light to mid green, soft downy, toothed leaves, arranged in pairs, with a stong pineapple scent. Four-angled stems, often becoming woody at their base. Spikes to about 20 cm long, with whorls of bright scarlet red, tubular flowers 3 to 5 cm long, during late summer and autumn. Attracts hummingbirds and butterflies. Flowers and leaves are edible, and are used for example in fruit salads and drinks. Prefers a sheltered position in full sun and well-draining soil. Leaves may droop during dry periods, but the plant is reasonably drought-hardy and will usually recover after watering. Tolerates poor soils, partial shade, and moderate frosts (USDA zones 8-10). May require staking in exposed areas. Cut back to near ground level after flowering, and bring indoors to overwinter in cold climates, or, in warmer regions, wait for it to come back in spring. In frost-free zones, or areas with light to moderate frosts, you can treat this as an evergreen shrub, pruning in winter to maintain a well-shaped, compact plant. 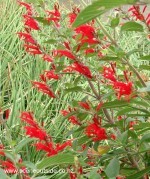 Salvia elegans is a fast-growing plant with a brilliant flower colour and fresh green leaves. Great addition to herb gardens, but will quickly grow into quite a tall shrub, so plant behind smaller growing herbs. In flower borders, combine this with other bright colours, such as warm oranges, yellows and reds to create a dramatic scene of hot colours. In combination with plants that have bold flower shapes such as dahlias, sunflowers, and Echinacea, Salvia elegans flowers add a touch of daintiness. Herbaceous perennial, native to Mexico and parts of the USA, flowering profusely during summer and autumn. Erect, four-angled stems. Ovate to lance-shaped, mid to grey green leaves with entire or lobed margins. Two-lipped, five-lobed, blue flowers tightly packed in spikes. The common name refers to the powdery white felt on the stems and the calyx of the flowers. Attracts butterflies and hummingbirds. Several cultivars available in shades of blue, purple, and white. Prefers a position in full sun or part shade and any well-drained soil. Tolerates poor soils. Indoors it likes good light, but some protection from full sun during the hottest part of the day. Reasonably drought tolerant. May become leggy in wet soils. Cut back after flowering. Tolerates light frosts, and is often grown as an annual in cooler climates. Generally trouble-free, but is susceptible to downy and powdery mildew. 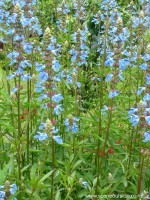 Salvia farinacea looks spectacular when planted in groups against a contrasting background. You can create striking colour combinations with yellow or orange flowering plants, or a more traditional look with pinks and whites. Taller cultivars are suitable for cutting and can also be dried. Shrub white, woolly stems and narrow, dull green, wrinkled leaves. Very free-flowering with spikes of violet purple flowers during summer and autumn. Cut back to near ground level in winter to keep the plant bushy. Native to Mexico and tropical America. A form of the common sage with purple young foliage that mature to grey green. The oblong to ovate, paired leaves are 5-8 cm long and have a puckered surface. Mauve flowers arranged in spikes, appear in spring or early summer. Prefers a sunny position in light, well-draining soil. Disikes wet feet. Drought tolerant once established. Trim after flowering to keep compact. Becomes woody eventually, but can easily be propagated from cuttings or by layering. Tolerates moderate frosts to about -10 degrees Celsius. Suitable for coastal gardens. Purple sage looks stunning in combination with the silvery-grey curry plant (Helichrysum italicum) as in the photograph. It also combines beautifully with golden oregano or thyme. The leaves can be used fresh or dried in herb butters, herb teas, soups, stews, or stuffings. Purple sage also has many medicinal uses. Evergreen clump-forming perennial with basal dull green to bluish green leaves. Pincushion-shaped buds on erect stems open to blue or lavender flower heads about 5-8 cm across during spring, summer and autumn. Prefers a well-drained, sunny position, but also tolerates shady conditions. Copes with drought and occasional high moisture levels. Very easy to grow and divide. Gradually spreads by itself without becoming invasive. Looks fantastic when in flower, and makes a great ground cover during the rest of the year. If you happen to have a Wisteria with lavender-coloured flowers in your garden, consider under-planting it with Scabiosa columbaria to create a gorgeous composition for very early spring when both begin to flower. Scabiosa will continue flowering for a long time after that. Bulbous plant with basal, linear leaves (20-60cm long and 2-4cm wide) flowering during spring with starry blue, 1.5 cm wide flowers arranged in dense racemes. Foliage dies down after flowering and a brief dormant period follows in summer. Is naturalised and regarded as a weed in some parts of Australia. Although 'peruviana' means 'from Peru', Scilla peruviana originates from South-West Europe to North-West Africa. Bulbs collected in 17th century Spain were shipped to England on a ship named 'Peru'. Carolus Clusius named the plant Hyacynthus stellatus peruanus, thinking that it came from Peru. Linnaeus continued the confusion by renaming the plant Scilla peruviana. Scilla peruviana is still the most widely used name, but this species has been renamed Oncostema peruviana. Prefers a sunny or lightly shaded spot in well-draining soil. Drought tolerant once established. Best planted during the dormant period in summer with the neck of the bulb just above soil level. Can be lifted, divided, and replanted, but may not produce flowers until after a year or two. Suitable for coastal gardens. Tolerates moderate frosts (zones 8-10). Stunning spring colour. In areas where heavy frosts occur, Scilla peruviana can be grown in containers and placed outside once the spring frosts are over. Forms a ground-hugging, moss-like mound of very tightly packed small leaves with tiny greenish flowers. Occurs naturally in coastal regions of the North Island of New Zealand. Unlike moss, it prefers full sun, and looses its tight habit if light levels are too low. Although reasonably drought tolerant, die back may occur when conditions are too dry. Scleranthus uniflorus is very similar to S. biflorus and has the same growing requirements, but is slightly lower growing and lighter green. S. uniflorus is found in exposed, Eastern areas of the South Island of New Zealand. Herbaceous perennial in the family of the Crassulaceae, native to China and Korea. Thick, fleshy, toothed leaves, 5-10 cm long, arranged in pairs or whorls. Large, 10-15 wide, branched heads of tiny pink to rose flowers in late summer and autumn on erect, thickened, succulent stems. Several hybrids are available, such as 'Herbstfreude'='Autumn Joy' with blue-green leaves and pink flowers, darkening to bronze with age. 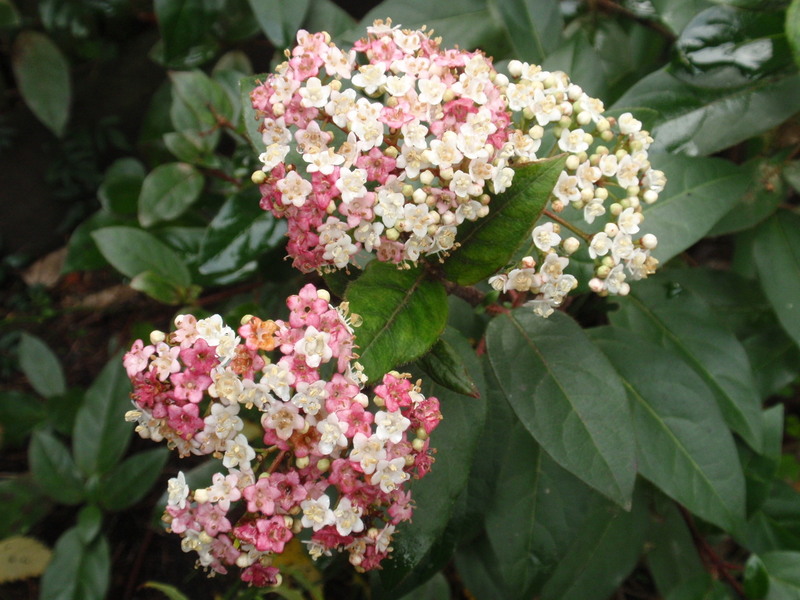 'Vera Jameson' has pale pink flowers and dark brown-purple foliage. Requires a sunny position in well-drained soil. Intolerant of wet soils, but copes well with dry conditions. Suitable for poor soils and coastal gardens. Flowering stems may need staking later in the season. Cut stems back to ground level after flowering. By that time you can usually see the tiny rosettes of new leaves at the base of the stems. If the plant becomes too large for where it is and you would like some more elsewhere in your garden, divide it in early spring and replant the separated portions. Sedum spectabile looks lovely when it comes back into growth during spring with a tidy clump of grey green leaves, and later on with a magnificent display of colourful flowers, opening from green buds. Combine for example with white or pale pink, late summer flowering perennials. Clump-forming evergreen perennial with stiff, linear to sword-shaped, grey-green leaves and creamy yellow leaf margins. Star-shaped, pale yellow flowers during early summer, clustered along erect, 0.7-0.9 m long stems. Sisyrinchium striatum is native to Chile and Argentina. 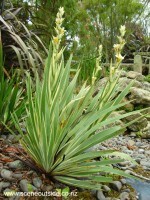 Synonym: Sisyrinchium striatum 'Variegatum'. This plant has been has been reclassified as Phaiophleps nigricans 'Aunt May', but is still much more widely known under the original name, and hence is listed here as Sisyrinchium striatum 'Aunt May'. Plant in a sunny or partially shaded position in any well-draining soil. Hardy to about -150C (a bit less hardy than the species itself). Tolerates poor soils. Copes with dry spells once established, but really prefers a regular moisture supply. Does not tolerate boggy or waterlogged soils. Suitable for coastal gardens as longs as it is not constantly exposed to strong winds. Remove spent flower stems and discoloured leaves. Divide the plant every couple of years and replant the separate fans. Striking plant for a structural accent or focal point, in particular when planted in groups. Combine with contrasting foliage plants, such as fine-leafed grasses like Carex species and shrubs with relatively large, rounded leaves such as Bergenia. Evergreen, low-growing, spreading shrub to 1.5-2 m with golden yellow flowers during winter. Attracts nectra-feeding birds.Tubular flowers, 3-5 cm long, appear well before flowers of other commmonly grown kowhais. Pinnately compound leaves with small leaflets. The common name for New Zealand Sophora species is kowhai. Sophora molloyi occurs naturally in dry, exposed headlands around the southern part of the North Island of New Zealand. 'Dragons Gold' is a selection developed by Terry Hatch of Joy Plants, Pukekohe, New Zealand, and originated from seedlings grown from seed obtained from Sophora molloyi on Stephens Island. The selection was named 'Dragons Gold' in reference to the tuatara population on Stephens Island. Prefers a sunny or partially shaded position in any free-draining soil. Grows somewhat slower in poor soils. Tolerates exposed sites, coastal conditions and medium frosts (hardy throughout New Zealand). Drought tolerant once established. Trim after flowering to maintain a tidy habit. Can be trained as a standard. Suitable for hedging purposes, but fewer flowers will be produced with regular trimming. Keep an eye out for caterpillars. Insecticide applications may be necessary to prevent the Kowhai moth caterpillar from defoliating the plant. Ground-covering plant with soft grey-green leaves. Stems and foliage are covered with silvery white down. Upright stems with tiny pale mauve flowers arranged in otherwise grey spikes.